Sean ~ Jamie ~ Reesa Stutzman: Thank You St. Louis! Over the last couple of months our family has been fortunate to receive an abundance of support from the St. Louis Cardinals and Cardinal Nation. Sean's long-time friend, Skip Schumaker plays second base for the Cardinals. Skip has been our close friend for many years as he was the Best Man in our wedding and Sean was the Best Man in his. When Skip found out that Reesa was diagnosed with Krabbe disease he decided to use his influence to help us raise funds for her medical care and raise awareness for this rare disease. Even Skip was surprised at the overwhelming backing he received from his coaches, teammates, the media and the St. Louis community. Cardinal manager, Mike Matheny, immediately committed half the proceeds from his annual Catch 22 Golf Tournament to help with Reesa's medical care. This charity golf tournament was held on June 11th and was our first taste of Cardinal Nation. We were blown away by the amount of philanthropy and kindness that was shown to us by Coach Matheny and the hundreds of attendees. People who had never met us or Reesa showed genuine compassion for our plight. It is truly a day that we'll never forget. 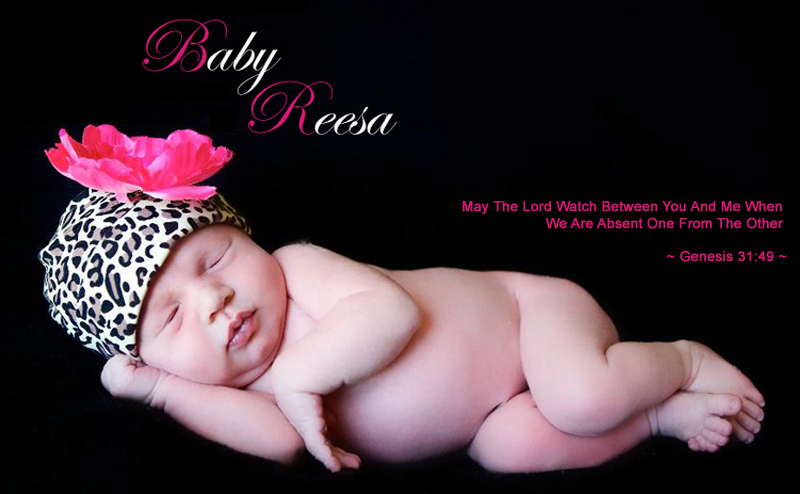 The last and most recent spectacle in Reesa's honor was Baby Reesa Night at the Ballpark held on August 8th as the St. Louis Cardinals faced the San Francisco Giants. Grandpa Mike and Sean's cousin Don Cook from New York joined us as we received the red carpet treatment the entire day. Sean, Jamie and Reesa went onto the field before the game to throw out the ceremonial "First Pitch" to Skip Schumaker and Mike Matheny. It was a once in a lifetime and surreal experience for us to stand before a packed Busch Stadium, look up at our family on the jumbo-tron and know that all of this is because of our little girl. After the pitch, we watched the entire game from the President's Box. Towards the end of the game Reesa started to smile and let out a laugh like we haven't heard in months. It was the perfect end to a perfect night! We are so blessed and deeply grateful to have this kind of support. It has helped turn a tragic situation into an enlightening experience for the thousands that have been affected by Baby Reesa and her journey. As parents, we will cherish these memories with our little girl for the rest of our lives. Our mailbox has been full of letters and hand-made cards from children all over the country who have never met Reesa but say they pray for her every night. Thank you to all of the wonderful people who have made this possible! May each day be a blessing! Continued thoughts and prayers! Hugs to all, espcially to Baby Reesa! What an awesome friend you guys have in Skip and what an incredible outpouring of support from St. Louis! It's not surprising that Miss Reesa has received so much love and support because she is such a beautiful soul but it's incredible how many people have come out to support in so many ways. Glad you guys had such a great experience. I llove her little smile, it's priceless! God bless and love you guys! I get to see all the Carinal games here in New Jersey thanks to Pay TV. I made sure i watched the game the night of "Baby Reesa Night at the Ball Park" I check this website every day. Glad you posted these Great pictures of all of you that night. Hugs an kisses for Reesa. My thoughts are always with you. I am an avid Cardinals fan in Illinois and really admire Skip for starting what he has to help Reesa and all of you. I am so glad you have made this site so that you have so many wonderful memories of your little sweetie. I don't know you, but my thoughts are with you and your family and friends as I cannot even imagine how tough this has been for all of you. I am now a St. Louis Cardinals fan.